I foolishly left the library book I was working my way through at work, and wouldn’t be back for at least a week, so I looked for something that seemed like it would be easy breezy to hold me over until we were reunited again. I chose We Were Liars, which ended up being a quick and not too difficult read, fun at times but also emotional. I can’t say that I totally connected with it, however, and I wasn’t entirely sold on the ending: not because it doesn’t work but because after a certain reveal, it seemed like some things didn’t quite jive with the behaviors of all the characters, and also it was something I had seen often enough before (sometimes in more effective ways, sometimes not, to be fair). 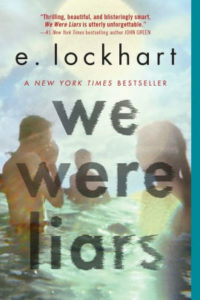 We Were Liars comes from the point of view of Cadence (or Cady), the oldest grandchild of a wealthy family, who spend their summers together on a private island. Cady and her fellow older cousins (along with one not-quite-cousin) are practically inseparable during these summer months and refer to themselves as The Liars. Yet, the year Cady is seventeen will be a different one: when she was 15 she was involved in some kind of accident on the island which resulted in a brain injury, leaving her with terrible migraines and little memory of what happened that summer, with the exception of a few little snapshots of images here and there. After spending a year away, she now returns to find her grandfather’s health and mind deteriorating, and many of her cousins acting strangely around her. There is the suggestion of secrets abound, and Cady struggles to find what exactly her place is in this new environment, and to try and find out what exactly happened to her that summer that she can no longer remember. This story promises secrets and twists as Cady comes to understand the reality of her family’s life and the power structures within. She learns about love and relationships, identity, and the greed at the heart of her family. Cady herself is an interesting character and her process through the novel is one I was curious enough to follow, though many of the other characters seemed to be in there in a way that suggested they were important to Cady and her family, yet didn’t feel like there was much to them at all: they were fleeting and somewhat one-note (or two-note, at best) to really feel like they were as important as we are supposed to believe them to be. Also, while the conclusion was impactful, it was also a bit of a gimmick given how everything else had set itself up. Or at least, I felt like the feeling that a big reveal or twist was on it’s way the whole time made the ultimate reveal feel like a bit of a letdown. And like I said, it was one that I had definitely seen before and laid everything on real thick right near the end, especially given how Cady seems to piece it together very quickly and we are to see a change in her character so abruptly in how the story plays out. Perhaps this is all a part of the development of her as an unreliable narrator, given her issues with memory, etc. Ultimately, this was a decent and quick read and certainly not as simple as it seemed. Yet, I just didn’t connect to it in a way that makes me feel like it will be one to stick around in my mind in any meaningful way. Share the post "A Little Bit of a Fleeting Feeling"
This one left me feeling cold. I think it’s because I called everything that happened and that Lockhart didn’t make me care about the characters.